The second photo shows the “kill point,” or final corner, which usually is a mis-match. Today it matched perfectly. That only happens about once every two-three years! 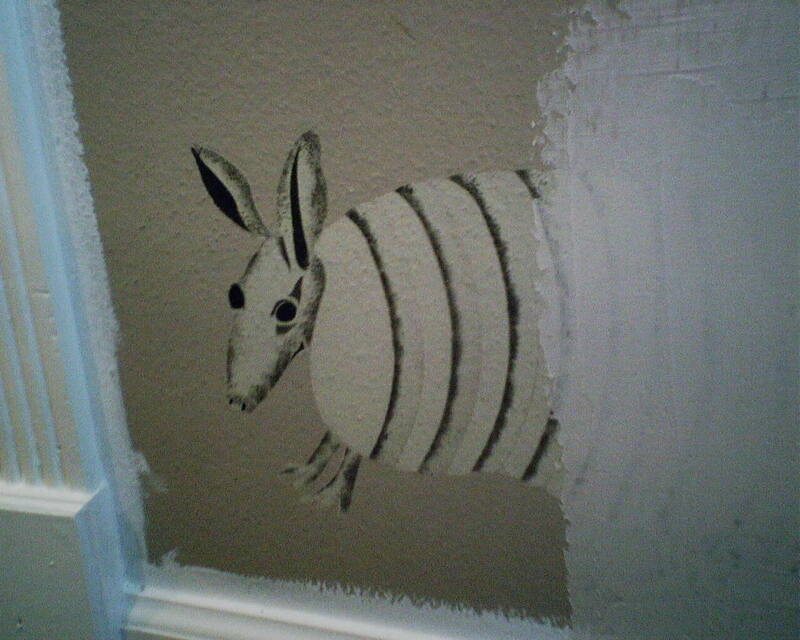 So I spent all yesterday and half of today smoothing textured walls in a master bathroom in the Heights. Primed the walls, then lugged in my table, 40-pound bucket of paste, tools, etc., then opened the rolls of paper to find this – banged edges. Come on, Brewster, just put a little bubble wrap in the bottom of the box before throwing it on the truck and into the hands of hasty and clumsy delivery guys. 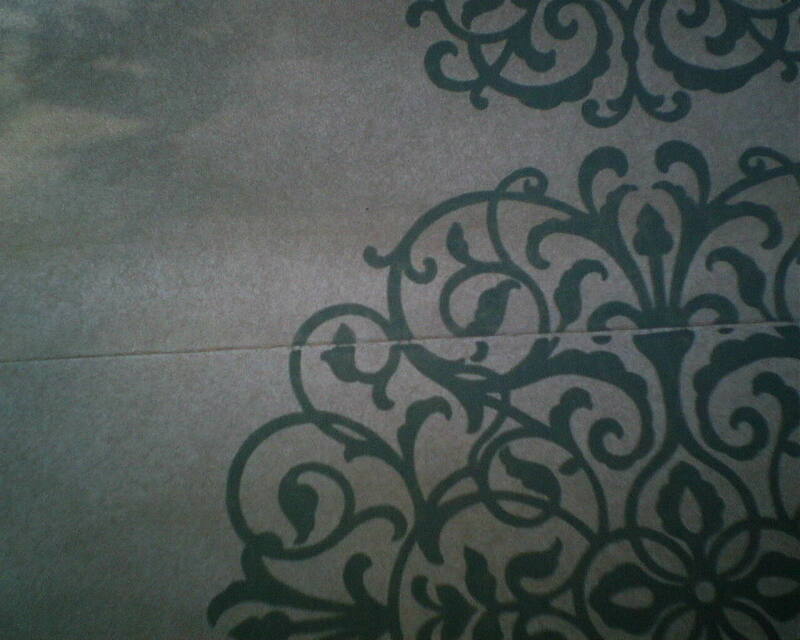 This paper is thick and spongy, one of the new “non-woven” backings manufacturers are rushing to use these days. 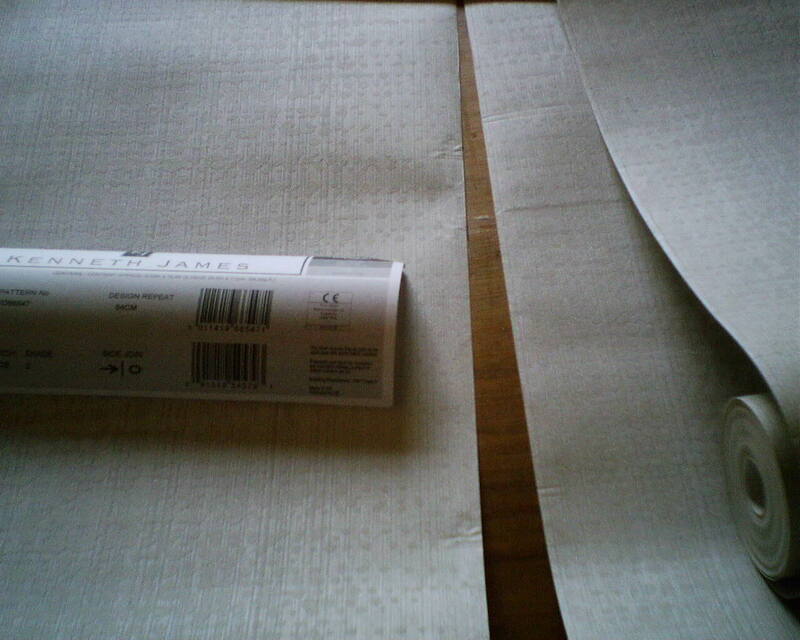 With a thinner paper product, minor bangs will often dry flat. But with this N-W material, the dents are here to stay. The paper also creases easily during handling. 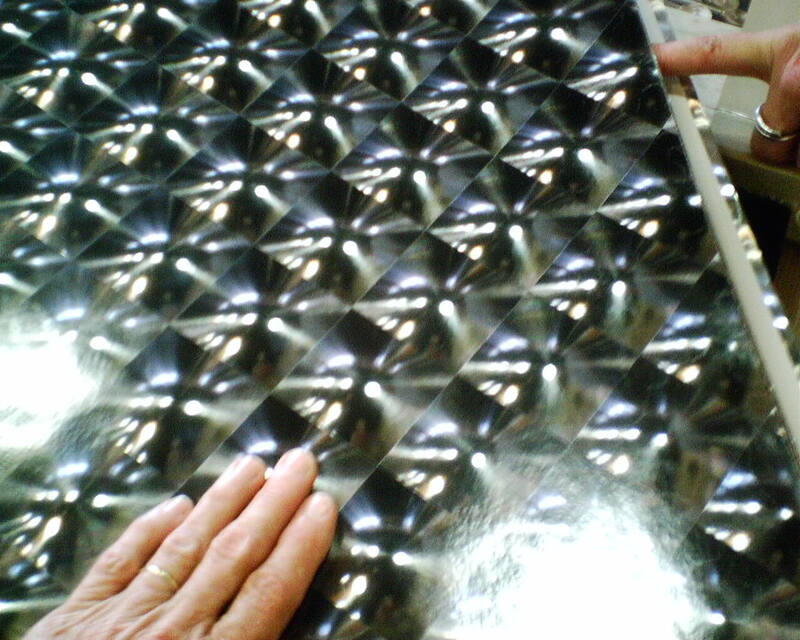 Because it’s a shimmery finish on a relatively plain pattern, these imperfections will really show. I didn’t want to put it up, and the client agreed. I feel confident that reordering the same thing will result in more banged edges and unusable paper, so I recommended that she choose something entirely different, preferably not one of those danged non-woven papers. 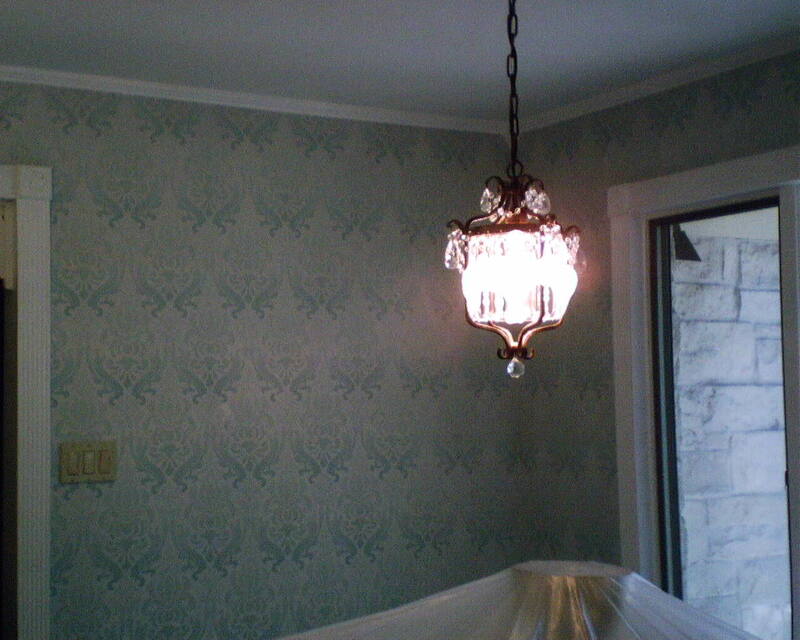 This wallpaper was from HGTV’s line, available at Sherwin Williams stores. 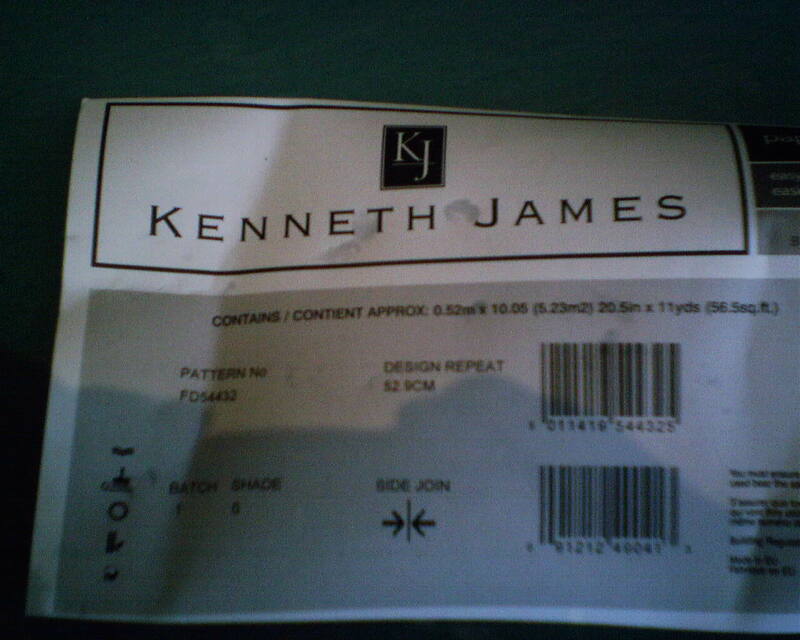 The actual paper was by designer Kenneth James and manufactured by Brewster. 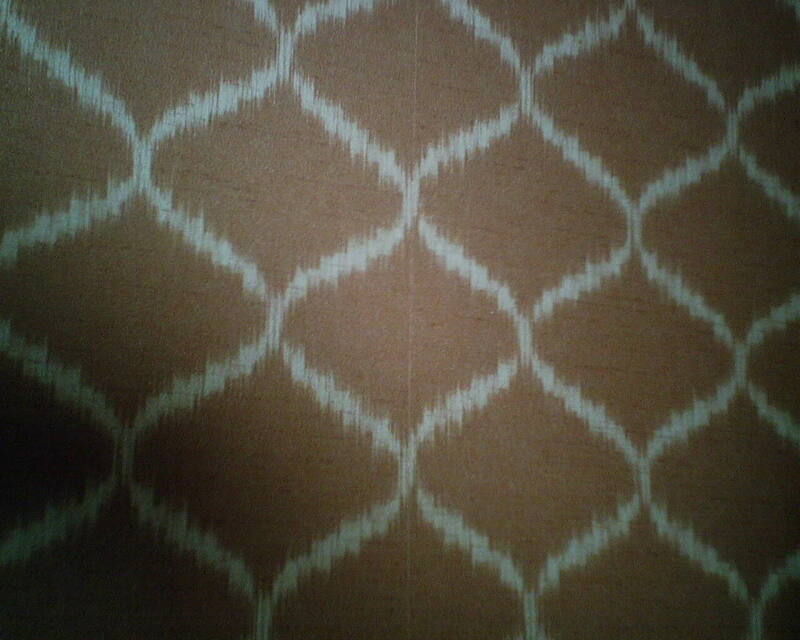 Pattern # F66547. Before and After: In the first photo, you can see the original chocolate brown wall color, which I thought was lovely, but the homeowners hated. Behind the bed to the left are sample paint swatches they tested on the wall – before agreeing that wallpaper was a much better solution! It’s a mix of traditional and contemporary, and the homeowners loved it. 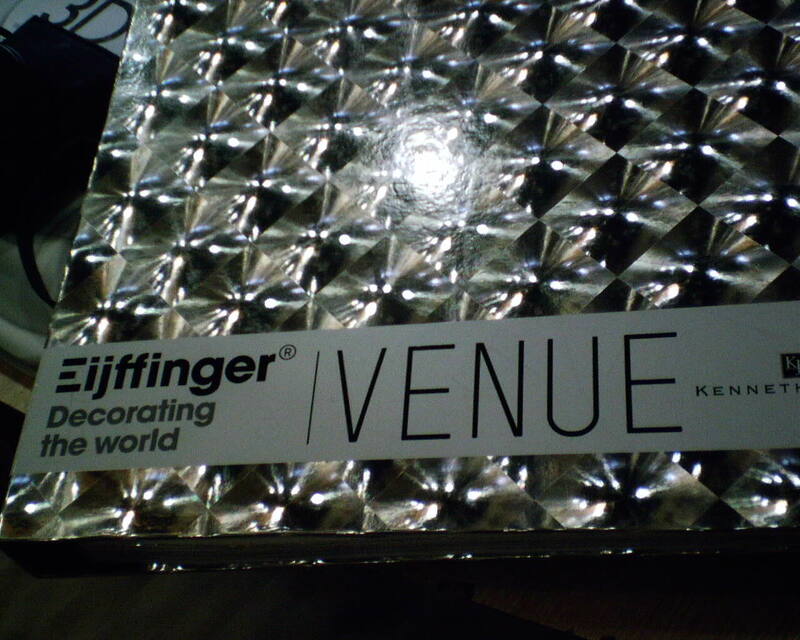 I’m trying to talk them into putting some kind of metalic paper inside their tray ceiling, to pull it all together. 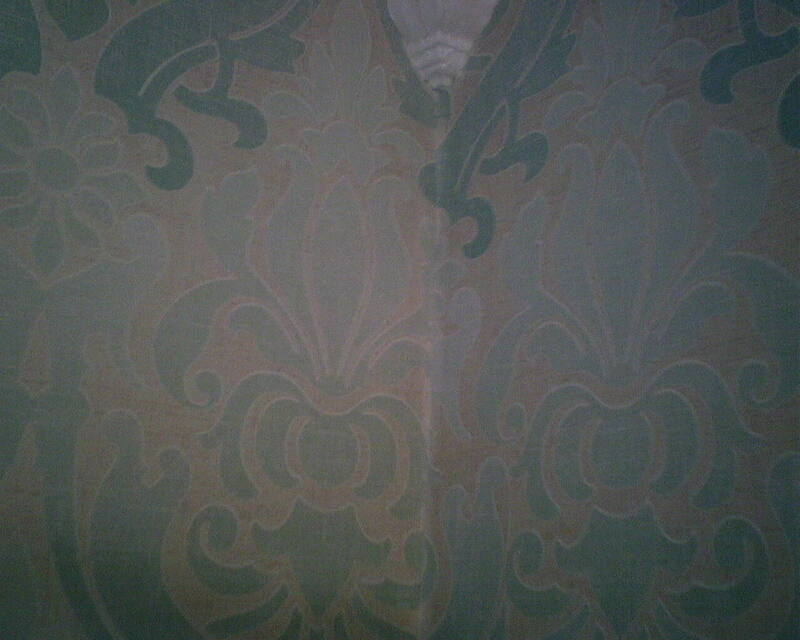 Can you see how the pattern match is off, in this damask pattern? Looks to me like the trimmer should have cut off an additional 1/16″ of an inch or so. Time to call in the homeowner and discuss options – send it all back, delay the job, risk getting the same problem again. Or accept it as is and live with the relatively minor flaws. He went for putting it up and getting their room finished. Out of 15 strips (3 per each of 5 double roll bolts), six displayed this mismatch. 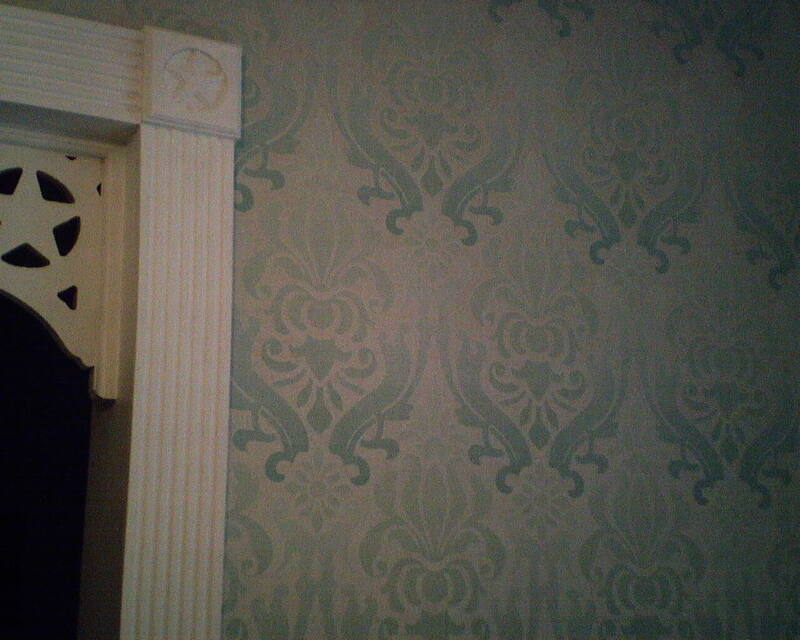 I needed 10 strips to do the accent wall, so I used nine good strips, and was forced to use one of the bad ones. The mismatch was slight, and it was only on one seam, not in a real noticeable spot. From a distance, no one could tell. 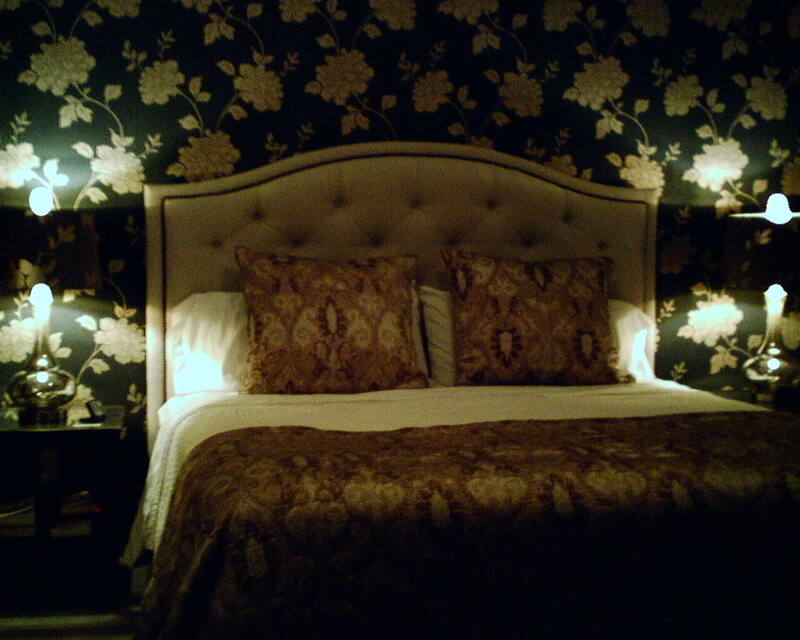 Accent walls behind the headboard in a bedroom are a big trend right now. It’s a great way to get a lot of WOW for a little money. 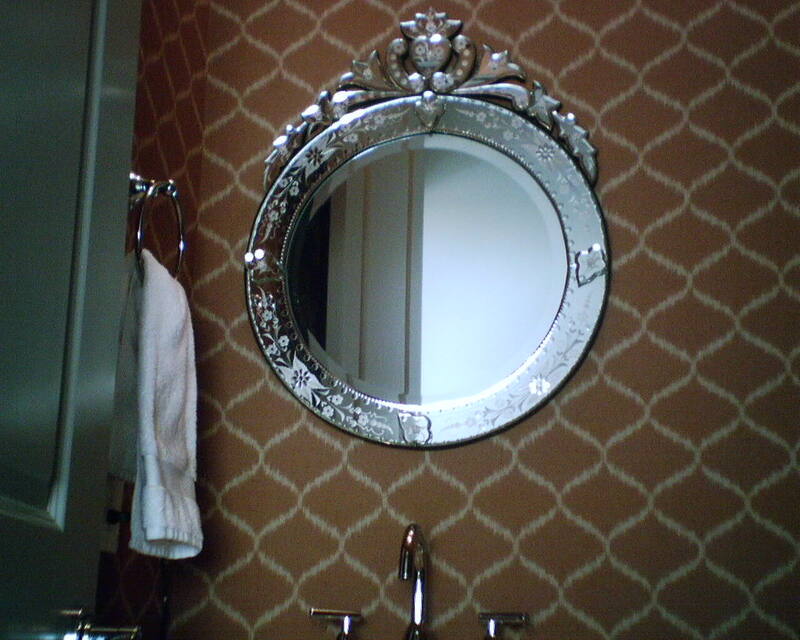 By doing only one wall, the paper becomes an accent and a focus, but does not overwhelm the room, as this large pattern most surely would if it were on all four walls. And you’re only paying for material and labor for one wall, which is much less than if the whole room were done. I hung this one recently. 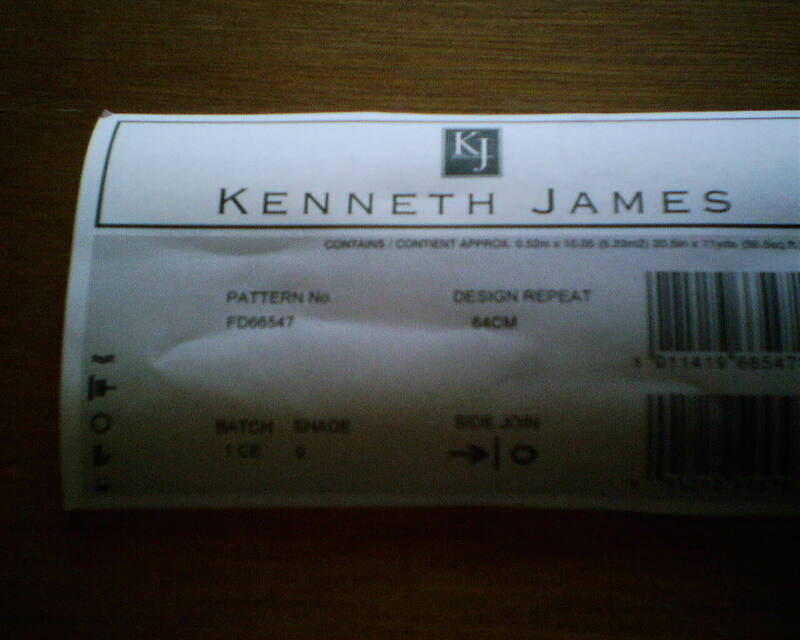 I’ve been hanging a lot of Kenneth James patterns lately, and this is one. From Brewster. 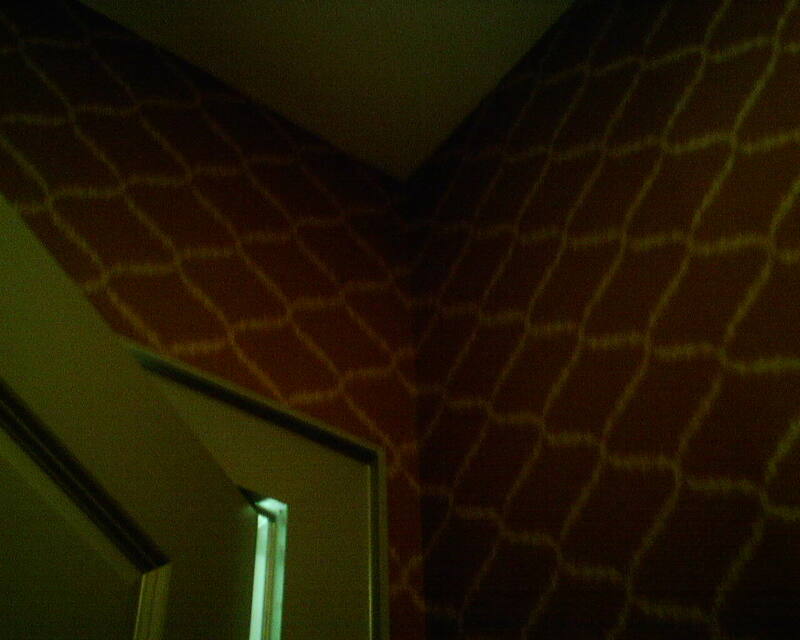 Pattern # FD58468. This is some of their “easy to hang, easy to remove” non-woven “green” stuff. It performed OK on this one flat wall, but, since it’s quite stiff, it would be difficult to use in a bathroom or kitchen, where it would have to be cut around details like sinks, toilets and molding, or asked to fold around corners and fur-downs. Then again, when it’s time to change it, since it’s on a very rugged substrate, simply loosen one corner, pull, and the whole strip will come off in one piece. There should be no scraps left on the wall, and no damage done to the wall’s surface. Can’t beat that. Flaw of the Day – a Splice! 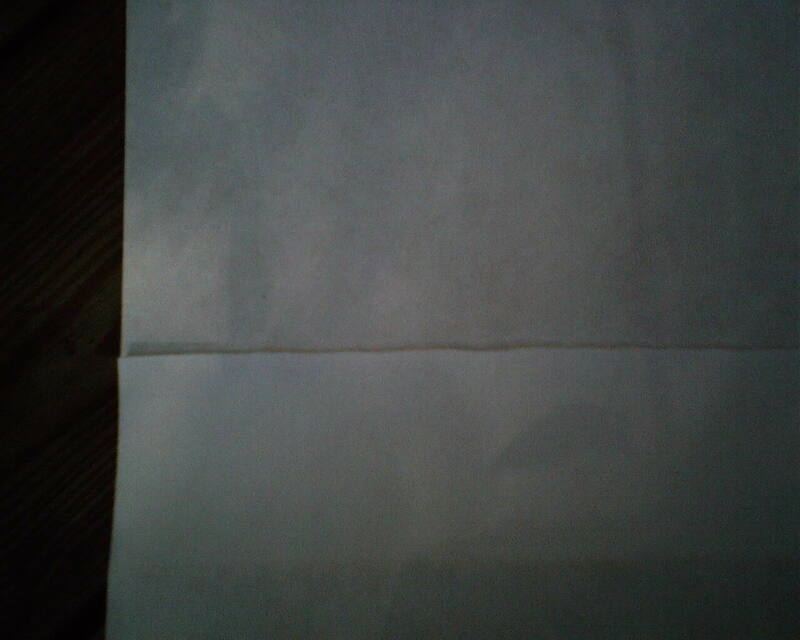 About 3′ from the begining of this double roll of paper came this surprise – a splice! 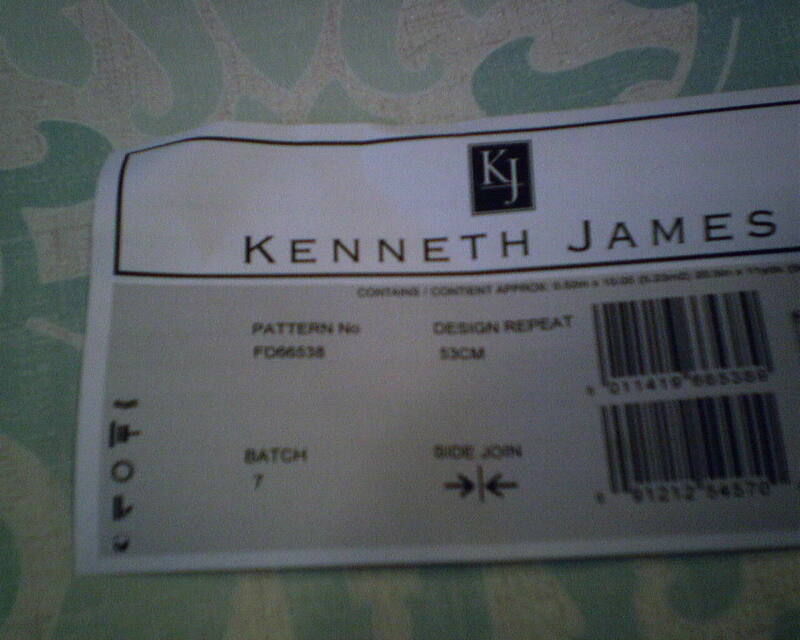 What happens is, the manufacturer runs out of paper before rolling on the full yardage of paper. So, to ensure the customer gets a full double roll, the manufacturer splices on some more paper. They try to do this as un-noticeably as possible. But, as you can see, with this very thick paper on a non-woven stock (more of the industry’s attempts at making “green” merchandise), the pieced in section is VERY noticeable, and would make a definately visible 20 1/2″ wide bump under the paper. In addition, even though the manufacturer includes extra yardage to make up for the messed up piece, it doesn’t mean you get the full amount you would have if the piece hadn’t been spliced in. Particularly when there is a long repeat, such as with this paper. What I mean is, for this job, I needed ten 9′ strips. From each double roll, I usually get three such strips. But if the first 3 feet are unuseable due to this patch, then I have to unroll a lot more paper to get my first 9′ strip. Then I cut off more to match the pattern in preperation for the second 9′ strip. Once that is cut off, there is a mighty good chance that there will not be enough remaining on the roll for my third 9′ strip. 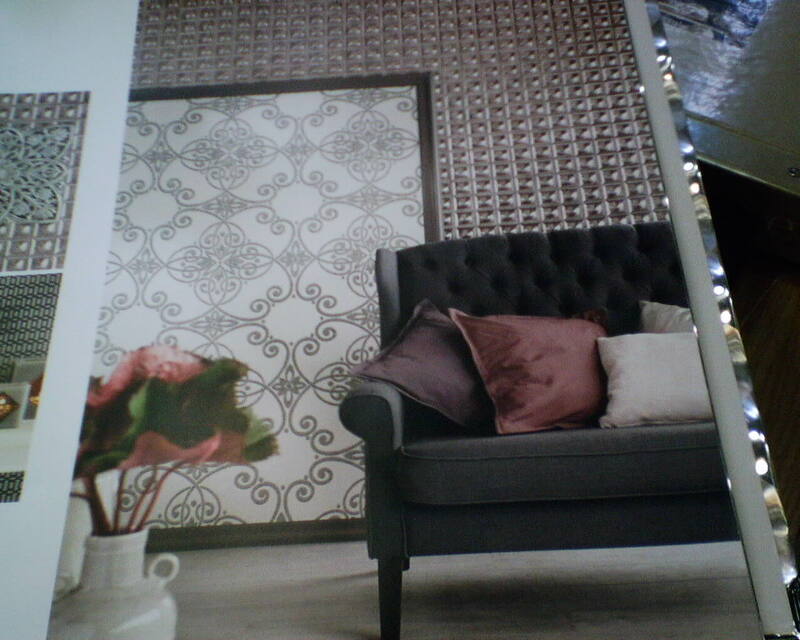 So you can easily see that simply throwing a few extra feet of wallpaper doesn’t really make up for the manufacturer’s failure to print enough paper in the first place. Incidentally, this was the same paper that had to be returned a month or so ago, causing a long delay for the homeowners before the new paper came, because of a printing flaw that mismatched the pattern. Additionally, the homeowner was unhappy with the fact that the extraordinarily thick, spongy paper resulted in somewhat visible seams – not to mention the few places where edges were bashed during shipping…such edges don’t always lie down flat. 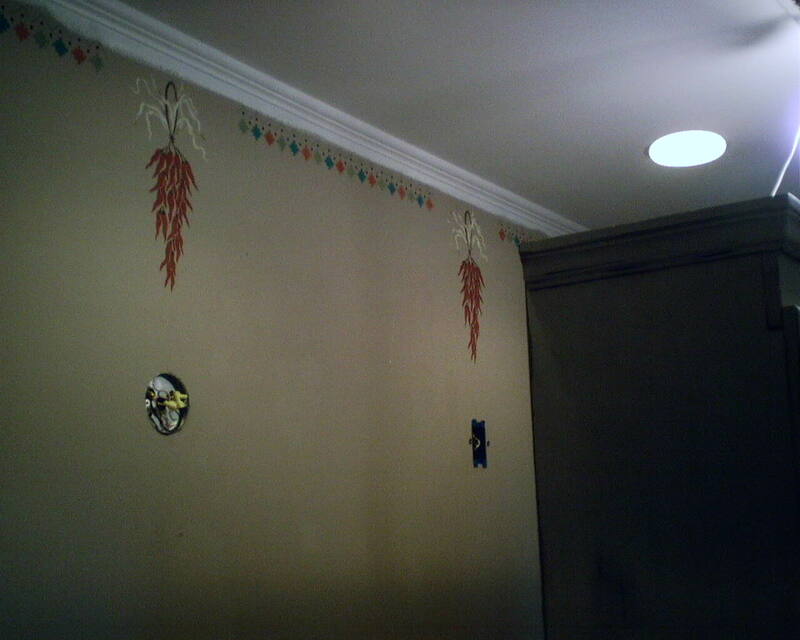 Note: Once I removed my 100 watt work light bulb and replaced the lower-wattage light fixture, and turned the fixture so it pointed down instead of up (where it illuminated the most offensive seam), the overall effect was much more pleasing. It was purchased through Dorota at Southwestern Paint (713 520-6262, who also helped with the batch that had to be returned.